[Spill the Beans] Is Monogamy For Everyone? All our lives, we’re bombarded with images that suggest that we will find “the one” —that special person who will inspire us to settle down and live happily ever after. From learning to cook to finding a rewarding career, we are constantly being programmed to look forward to a future where we will have a husband or wife – and a family. As women, we are expected to be ladylike women who only want to spend the rest of our lives with that special guy. Men, on the other hand, are not prepped to be husbands. They are told, in passing, that they will find “that one special lady” who will make him want to be a better man. Yet, when the topic of cheating is brought up, it is already assumed that men will cheat. The double standard struggle is real. This brings me to the essential question at hand: is monogamy for everyone? When looking at the abundance of talk about “jump-offs” and “side pieces” on social networks, one would think that monogamy doesn’t exist anyway. While monogamy can be a very meaningful aspect of life, is it necessary? Being with only one person at a time is a measure of your dedication and love for someone, and it is also a great feeling to know that someone wants to be committed to you and only you. However, with the proper amount of communication and respect, can one still achieve the same happiness without being fully committed to one person? Some may argue that monogamy is “natural” and is how God intended us to live. In all due respect for religious beliefs, how can we argue that something is “natural”? Nature is subjective. One can also claim that it is unnatural to be tied down to one person at a time due to the fluidity of our desires and needs at a given time. It is also human nature to not be completely sure of our decisions. What if it were okay for us to pick and choose our mates like we do toppings on a pizza? Can’t we enjoy cuddling with John while loving Bob’s body and engaging in intimate conversations with Henry? Just having one person is definitely ideal and more accepted in society, but the road to happiness is not a traditional path for everyone. If you have ever seen the movie “Savages,” you would understand how their relationship was perfect for them. Blake Lively’s character lived with both of her significant others and, before all of the drama with the drug business interrupted their life together, they had a perfect thing going. Both men had different personalities, but combined, they were the perfect mate. They were willing participants in a three-way relationship. Though not advocating for polygamy or bigamy, I am wondering if tradition is still the way to go about attaining happiness in a relationship. If you are completely honest with your partner(s), can you still achieve the same happy-go-lucky state of mind that a one-on-one relationship may provide? I think so. Like any relationship, there has to be copious amounts of communication and setting parameters in how it will work. Every base should be covered, especially with emotions being involved and possible health risks being taken. However, I believe that it can work for certain people, particularly those who do not do well in monogamous relationships. Enjoyed reading this post. Its definitely a hot topic, and I can see the points from both sides. 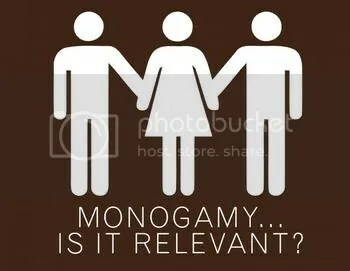 Personally, I think monogamy is the way to go. When one person in the relationship wants one thing, to be with one person, while their partner wants to explore more, but be with them, communication is needed. If people had the guts to speak up and say what they want, there wouldn’t be all those sad soppy stories about someone getting cheated on. I’ve been cheated on a few times by people who didn’t have the guts to speak up. Now, I am happily married to someone who I couldn’t imagine my life without, we’re very upfront with each other, and both want the same things, and in this case, we’re monogamous. Like you said, certain people can be with multiple people, but its a matter of them speaking up about it and exploring what they really want, and not hurting someone who wants something different. Thanks for your response! I agree wholeheartedly with everything you said. The key point in any relationship, whether monogamous or not, is communication. Without communication, relationships fail. Ok, I have poured over pro and anti and neutral monogamy things. The only thing I’m sure of (besides not being sure) is communication is key. Any pro monogamy (being biologically based) articles? I have literally devoted the past six months and 2 spiral notebooks to this topic. I’m sorry, I do not have any articles to point you in the right direction. However, you’re completely correct; communication is key.